The Breville Fresh and Furious Blender is the must-have appliance for your kitchen. It’s the ultimate smoothie blender and mixes everything from greens to Black Bean Brownies. With 9 task controls and a timer, you have all of the settings to make perfectly smooth smoothies, crush ice and make delicious soups. The Breville Fresh and Furious Blender feature the EVEN BLENDING KINETIX™ PERFORMANCE that combines the functions of a blender with the ability to perform tasks of a food processor. The unique blades are able to turn ice into snow while also being able to fold and aerate for creamy smoothies and soups. What we loved about the Breville Fresh and Furious Blender is how quiet it is while still being powerful. With so many options to control the speed and type of blend, you are looking for. The blades are made from surgical steel allowing them to keep their sharp. With a special green smoothie button, you can make a delicious smoothie recipe filled with nutrients and healthy ingredients. Check out Breville’s fresh planner for inspiration. The hardest decision you will make is what recipe to make first! The specialized controls and easy to read buttons are really easy to use. The new Green Smoothie button is placed beside the Ice Crush and Smoothie buttons make it easy to use your blender for exactly what you want to blend. Those features plus the large LCD display keep you informed of where your blender is at and it will alert to an overload. If you are looking for a truly fantastic blender that is ready to tackle anything you want to blend! Enter to win a beautiful Breville Fresh and Furious Blender from Breville Canada. Contest ends December 5, 2018, at 11:59 pm. Disclosure: Thank you Breville Canada for providing this blender to review. My daughter has been making smoothies lately but we’ve had to borrow my MIL’s blender. It’s time for our own! Because my old blender died and I live and breathe smoothies! My kitchen needs a Breville Fresh and Furious Blender so we can start having a healthy breakfast of a smoothie instead of cereal. ❤️ Breville. We have, small counter oven, I use for everything, rarely use the full size appliance. Also have the single cup (kcup) brewer and grille. Have never had any issues with any of them. This would be a fantastic addition. I love smoothies and it’s an excellent way to get my mom (whom I care for) to get her fruits and veggies. I have a Magic Bullet which has done fine for my morning smoothies for 10 years, but it’s reaching the end of it’s life. So onwards and upwards! I would love to win because I don’t have one and need one desperately. My blender from 1970 packed it in!!! This would be a wonderful kitchen assistant to prepare various batters (you mention Waffle Fast and Furious which I think is a typo but making waffle batter would definitely be easy!!! ), puree soups, and of course make some very tasty smoothies and adult beverages! Thanks for the chance at this awesome giveaway! My kitchen needs a Breville Smart Waffle Fresh and Furious simply because I don’t have them. The blender that I have is a one shot that you can only use for 1 smoothie at a time and it’s dying. I could really use a Breville Fresh and Furious Blender because my old one is dying and this would make cooking in my kitchen so much easier. I could do so much more with this than I can now with my old one that I inherited from my Mother. My kitchen needs this because i could use a new one, and it would get used a lot here. We could sure use this awesome blender! I don’t even own any blender, and this looks lie the ultimate blender! I could sure use this in the kitchen! I would be so easy making smoothies, soups and sauces with it. We need a new blender to replace the one I bought from over 25 years ago. It would make my smoothies in the morning faster and I wouldn’t late for work! I would love to replace my old blender. It doesn’t work as well and this one would super awesome. Breville makes such good appliances and I don’t have a blender. 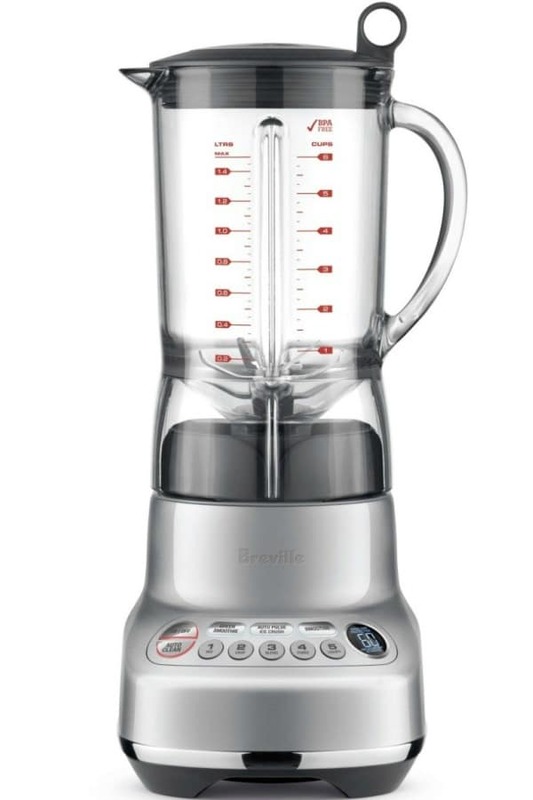 I haven’t owned a blender in years…my son keeps telling me we need one! I would love to win because I don’t have a blender and Breville makes excellent appliances. My blender died a couple of years ago and I still haven’t replaced it. I am trying to eat healthier and it would be nice to get into the routine of making smoothies. I could use the Fresh and Furious for Christmas cocktails and summer slushies. We don’t own a blender and it would be nice to have one for certain jobs in the kitchen. Joking aside I love to try out any of the “smoothies” to link you provided. I am truly wanting to change my habits to healthier and I think smoothies are the answer I’ve been looking for. This Breville Blender seems to be the ultimate blender so what a great way to start a new healthier me. I have to admit, I want one for the bragging rights! It’ not only a treat I’d use, but I’d be the envy of friends and neighbours too! I drink a lot of protein drinks and blended soups, due to digestive illnesses. Unfortunately, I make all of these with a blending wand, which is not easy. I’d love this blender! I want to start making smoothies for breakfast. Our kitchen needs a Breville Fresh and Furious so we can make smoothies. My kids have started watching cooking shows and we can’t make so many recipes bc we don’t have a blender. My kitchen needs a Breville Fresh and Furious Blender to help making smoothies and other recipes easier and perfectly! love to replace the old Blender we own! My old blender has seen better days and I would love a more efficient one. My kitchen needs one of these to help the mornings go more “smoothly” in making my smoothies! I need this blender to make healthy smoothies for my family. I would love to make them for breakfast. I would love a Breville Fresh and Furious to make smoothies… Healthy ones packed with fresh fruits and green vegetables. I would also have vegetable soups that are pureed. Thank you! My old blender went kaput. I had to throw mine out a few months back and really need a new one to replace it. I miss it because I used it for so many recipes from shakes to coleslaw. I purchased a new blender about 1.5 yrs ago and it is already starting to show it’s wear (seals leaking) hard to get lid on, cracked cups. I should of bought a better quality from a reputable company like Breville and I wouldn’t be checking out new blenders again so soon. I need this blender to help make healthy foods for my big family. I need to replace my old blender with a more powerful one! We don’ t have a good blender. This looks like it would be a perfect addition to my kitchen, multipurpose from milkshakes, to smoothies, to soups and hummus and more. My kitchen needs this because our current blender broke and I really miss it. Sadly our last blender broke, we are currently blender less. I need one because it can be used to make my post-workout smoothies and homemade soups! I need one because our old blender bit the dust and we are down to a Magic Bullet… which is good for nothing more than smoothies – and gentle thin ones only. Thanks for a GREAT giveaway! I only have an immersion blender so this would be great to win. I need this to help me make healthy and yummy smoothies to feed and please my family! We need a blender because ours broke down and is no more. Thanks. This would be great for mixing healthier meals and drinks! our blender has seen its days and we need to keep our healthy smoothie commitment going. My current blender is old so I could use a new one to continue making delicious smoothies. My girls are asking all the time if they could make smoothies but our current blender doesn’t do a great job. This would a great replacement. My picky eater just adores waffles! We love to make smoothies and use blender for lots of other uses as well. It will be nice to get a new one as we just replaced one hearing had to sent out to get fixed. I need a Fast and Furious because I don’t actually have a blender! I only have a hand blender, and it doesn’t always get the job done! I do have a blender but it’s very old now & pretty sad the way it blends, or should I say, doesn’t blend. Dull blades, slow sluggish power. I have no idea what it’d be like to use a machine this amazing in comparison. Would be like a dream! I would love to win (and this would be perfect for my home) as I LOVE to cook! I would love to win this so I can make my own smoothies in the morning and save money so I don’t have to buy my morning smoothies any more! We are a family who loves our smoothies day and night and having a hard working one is very essential in our kitchen. My kitchen needs a Breville Fresh and Furious Blender because our old one broke and hasn’t been replaced yet. We need a new one to blend smoothies, shakes, & sauces. My kitchen needs a Breville Fresh and Furious because we love to make smoothies and don’t have a good blender – the top on ours is broken, and although still useable it would be great to not have to hold it “just so” while making smoothies (and soups!). 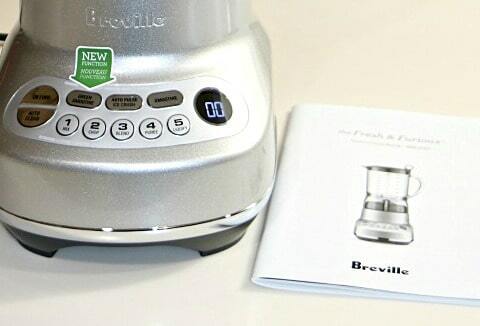 Breville makes great products, we’d love to add this one to our kitchen! My kitchen is sans blender after I broke mine a few weeks ago. Therefore the need is there.